Should you be adding speedwork into your early season swim training or focusing on technique and body position? Early attention to the latter will bring dividends when the endurance and squad training ramps up, so use your time smartly during these first few months of the year. Here are some tips for how to do it smartly and effectively. For the non-pure swimmers amongst us, it’s time to slow down for some mindful swimming, and checking on our proprioception. In other words, is what we think we are doing in the water what we are actually doing? If possible, get a friend to film you above and below the water, or go find a coach that will do this for you in a water environment setup for this task—the results will be long-lasting. At Lovetri we focus on three distinct swimming phases in the early season. The first phase is dedicated to technique. With this we focus on two main areas: the front of the swim and what most call the “pull” (we prefer to call these the press phase and push phase). When both areas are working correctly, it vastly improves the ability of the body to move efficiently through the water. On their own, each adjustment contributes a varying amount to forward progress, taken together, significant gains can be made. The second phase consists of consistent, below-threshold intervals that allow the athlete to work hard without giving up the gains of the technique improvement from the previous phase. Lastly, in the third phase we look at stroke turnover with a ramp test to find that sweet spot that combines speed with a sustainable effort over distance. The science of swimming fast freestyle cannot be given justice in this short article, but we’ll highlight two linked areas of technique that we look at with each athlete. Usually what happens at the front of the stroke (and under the body) ripples down to compensatory movements in the hips and legs, which serve to slow the swimmer down. Despite some debate, we advocate a wider entry point for the hands, held loosely upon entry. Many athletes enter their hands and arms into the water parallel with the shoulders, then cross the centerline. Many enter across that midline point resulting in an under body pull and a scissor or uneven kick to start the hip roll in the opposite direction. They simply don’t understand why they are crossing when they enter in-line with the shoulder. So, we show the athlete what this looks like on land. They stand in front of the coach and are asked to mimic where their hand enters the water. The biggest thing we find is that they stand face on, and when you ask them to rotate through the hips (keeping everything else still), you’ll soon see that with their rotation the arm usually ends up across the body of the person standing in front of them, and that arm in the water creates a nice amount of frontal resistance, pulls under and usually toward the opposite hip, not what is needed or wanted. The other linked timing action is breathing related. The front arm, rather than staying out in front of the swimmer momentarily in a support stance, is taken out wide to the opposite direction of the head turn, resulting in drag, a pull to the opposite hip in most cases, and a dead spot in the stroke. Here we encourage athletes to leave their arm out in front a moment longer, the timing cue is to start the pull as the face enters the water, not before. Most report these first attempts as clumsy, and describe it as feeling “wrong.” Persevere, as this is tricky to coordinate for a swimmer who has been swimming this way for a long time, but when they get it right, they soon notice that their forward momentum is improved, and most (or all) of the dead spot in their stroke is eliminated. If you find breathing bilaterally tricky, this tip usually makes it much more comfortable and easy to master. 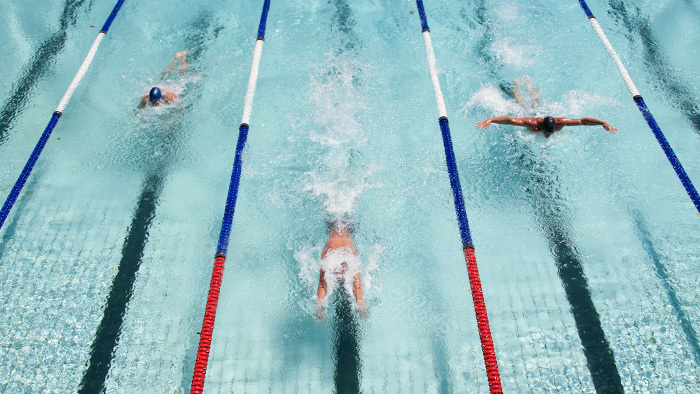 We are also advocates of the Swim Smooth CSS protocol, where by undertaking a simple pacing test available here an athlete is able to consistently train at a level that allows proper technique, is challenging toward the end of the session, and works smartly to increase threshold swim pace. This is akin to sub-threshold training in running. It works by combining a swimmer’s sub-threshold 25 or 50 pace over multiple repeats with short rests, easy at the start, not so easy at the end. Results are fast coming, so regular retesting is necessary. In phase three we overlay a stroke ramp test, which is simply asking the athlete to start at their normal stroke rate, and then asking them to swim three strokes a minute faster each 25 or 50 repeat. We record their time, perceived effort and stroke turnover, producing a rough graph we can use to ascertain a likely optimum stroke rate. Simply put, an athlete increasing their stroke rate (without breaking down) should get faster with each short interval, and many will do so at the same perceived effort for that increased stroke rate. The sweet spot turnover is generally where the athlete’s interval times are at their fastest, the stroke rate is sustainable if hard, and their perceived exertion is the same as the last interval (which was slightly slower). This test is based on perceived exertion, so it’s not an exact science, but it’s pretty accurate and can be fine-tuned as the athlete learns to swim with an increased turnover. So, make your choices, plough up and down the pool for the next six weeks, or invest in yourself to become a neater, smarter swimmer. The speedwork comes later, and the faster times will take care of themselves come race time! Check out part one in our early season speed series, which focuses on the run, and part two, which focuses on cycling.